Description: For John Deere tractors with 2 cylinder gas engines Using 7/8 -18 thread reach, 15/16 hex spark plugs. For Delco distributor thru 1963. Fits tractors 40, 50, 60, 70, 320, 330, 520, 530, 620, 630, 720, 730. 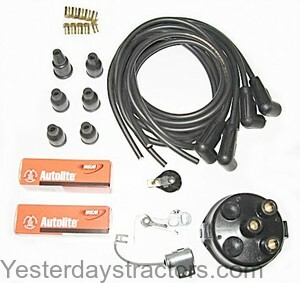 Includes: Spark plugs, heavy duty points, condenser, rotor, and gap gauge, universal spark plug wires, and distributor cap. FOR 6V VOLT SYSTEMS.